This chest consists of a three plank top with moulded edge leading down to two short over three long drawers. 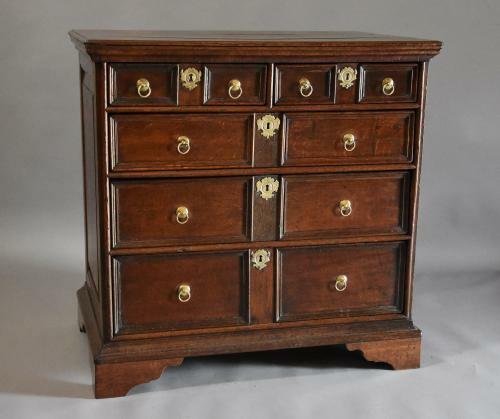 The top two drawers have the appearance of four small drawers and the long drawers having the appearance of two drawers, each drawer having brass handles and escutcheons, the drawer linings being elm. The handles and escutcheon plates are not original and have been replaced at some time possibly due to fashion changes but have been fitted on the chest for a number of years. The sides of the chest are panelled which is a nice feature and the back is elm. The bracket feet are also not original having been replaced some years ago, again possibly due to fashion changes, the chest would probably originally have been fitted with bun feet. This chest is in very good condition for age, is of stable construction and can go straight into a home.